The above table is adapted from American Society of Clinical Oncology and results of Bagnardi et al (2015). For the types of cancers shown in the diagram, risk is directly related to dose.3 For breast and colorectal cancers, which have lower relative risks compared to other cancer sites, the higher incidence rates of these cancers in Canada contributes to larger population-level impact. Alcohol consumption in Canada is on the rise, due in large part to a lack of awareness of health risks (including cancer risk) and increasing access and availability of alcohol products.4 Strategies to reduce alcohol-related harms have traditionally taken an educational approach focused on ‘excessive’ alcohol consumption.5 Implementing effective policies that build on existing alcohol policy strategies and previous experiences in tobacco control will support reductions in alcohol consumption and cancer risk in Canada. 1- International Agency for Research on Cancer (IARC). IARC monographs on the evaluation of carcinogenic risks to humans, volume 96. Alcohol consumption and ethyl carbamate. Lyon, France: IARC; 2010. Available from: http://monographs.iarc.fr/ENG/Monographs/vol96/mono96.pdf. 2- Connor, J. (2016). 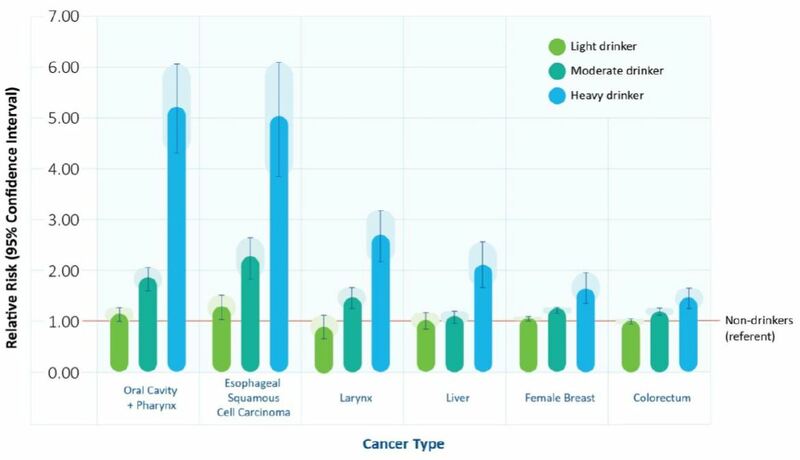 Alcohol consumption as a cause of cancer. Addiction. doi:10.1111/add.13477. 3- LoConte, N, Brewster, A, Kaur, J, Merrill, J, and Alberg, A. (2018). Alcohol and Cancer: A Statement of the American Society of Clinical Oncology. Journal of Clinical Oncology, 36:1, 83-93. 4- Giesbrecht, N, Wettlaufer, A, April, N, Asbridge, M, Cukier, S, Mann, R, McAllister, J, Murie, A, Plamondon, L, Stockwell, T, Thomas, G, Thompson, K, and Vallance, K. (2013). Strategies to reduce alcohol-related harms and costs in Canada: A comparison of provincial policies. Toronto: Centre for Addiction and Mental Health.